The roof on your home is an absolutely essential part of the comfort and security of your home. It provides the protection you need against rough weather and helps to make sure you can stay dry and comfortable inside your home. Sometimes when the weather gets rough enough, or your roof is just getting older, it can sustain damage and wear that inhibits its ability to do its job effectively. Here at Magnum Contracting Group, our team of professional Glen Head roofing contractors can help you ensure that your roof stays in good repair and can continue to do its job effectively now and for years to come. Our team of expert roofing contractors are highly skilled and highly experienced with both residential and commercial building roofing needs. From installation to repair or replacement, we are familiar and knowledgeable about the care of your roof through all of its various stages of service life. We strive to deliver top-notch quality care in every single service we offer, and move forward with the goal of adding long-term value to your home in every task we perform. This dedication to excellence has been one of the hallmarks of our business motto since we began, and we have no intention of changing it now. When you are looking to hire a professionally licensed roofing contractor in Glen Head, give the professionals at Magnum Contracting Group a call today. Our staff is always standing by and willing to answer any questions you may have whether you are looking to schedule an appointment for service or just have some general questions about roofing or remodeling. Our team of knowledgeable experts are always happy to offer advice and answer questions. Call us today to schedule your appointment. At some point in time, every roof on every home needs to be replaced. Knowing when it is time to have you roof replaced can be difficult to ascertain without professional help, but the professionals at Magnum Contracting Group are here to help. Our team of experts can inspect your roof and let you know what the best method of resolving your problems will be. If it turns out that replacing your roof is the best option, we will make sure the task is resolved as efficiently and effectively as possible. We work with all conventional roofing materials from asphalt shingles to metal roofing replacements, and much more. Keeping your roof in good condition is important to the overall health of your home. Just like anything else, your roof requires maintenance every so often to make sure that it is working as well as it can be. If there are leaks in your roof, you could be looking at extensive damage to the interior of your home very quickly. 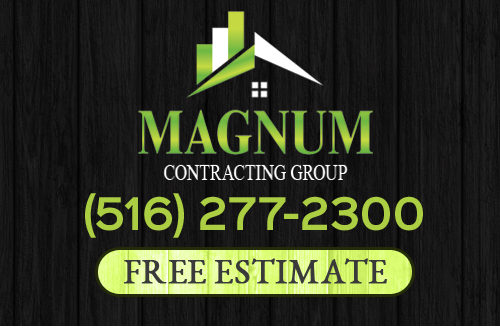 Whether your roof has had serious damage as the result of a recent storm, or your roof is just getting a little older and has developed a small leak here or there, the professionals at Magnum Contracting Group are here to help. From routine maintenance to emergency repairs, we can handle it all when it comes to your home's roof. If you are looking for a professional roofing contractor in Glen Head or the surrounding area, give us a call today at 516-277-2300 or complete our online request form.